When a piece of clothing wears out or goes out of fashion, it often gets tossed in the trash; clothes made up 9 percent of all municipal solid waste produced in the U.S. in 2014, according to the Environmental Protection Agency. And the impact of what we wear goes well beyond clogged landfills. The European Commission has also linked modern clothing industry practices—often described as “fast fashion,” due to the speed and volume at which garments are produced and marketed—to high energy and water use, significant greenhouse gas emissions and water pollution. 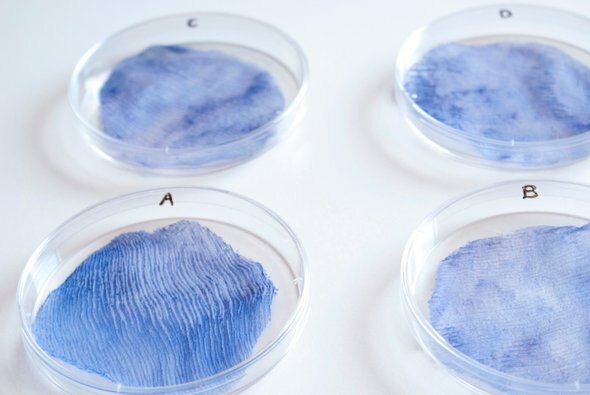 Now a small but growing group of innovators is turning to the genius of nature in an attempt to put wastefulness and pollution in the apparel industry out of fashion, right at the source: They are using live organisms to grow pieces of biodegradable textiles, creating environmentally friendly materials in the laboratory—and are even producing some near-complete items without the need for factory assembly. Schiros’s organism of choice is algae. With it, she and a team of F.I.T. students and faculty have created a yarnlike fiber that can be dyed with nonchemical pigments such as crushed insect shells and knitted into apparel. There are three steps in making alga-based yarn, Schiros says: First, a sugar called alginate is derived from kelp—a multicellular algal seaweed—and powdered. Next the alginate powder is turned into a water-based gel, to which plant-based color (such as carrot juice) is added. Finally, the gel is extruded into long strands of fiber that can be woven into a fabric. 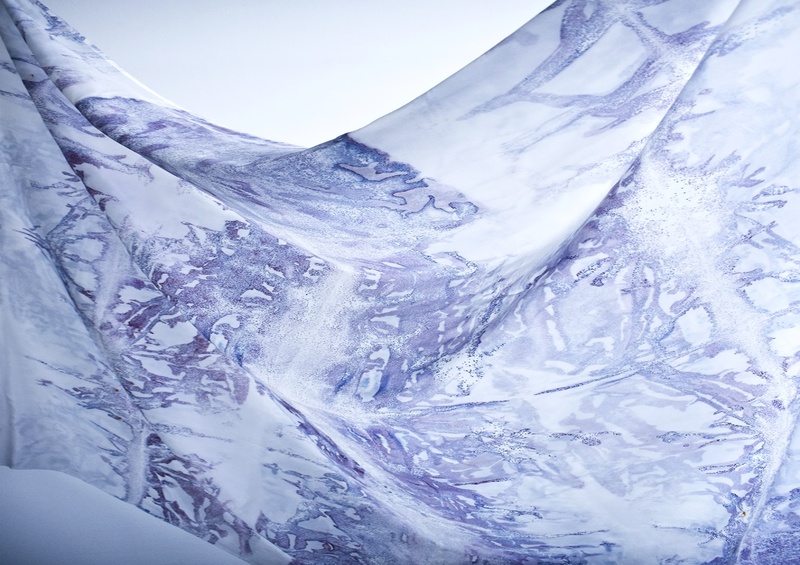 Schiros says her experiments show alga-based fabric holds considerable promise as a marketable bioengineered clothing material because it is strong and flexible, two properties essential for mass-market apparel. Materials scientists in China have noted that alga-based fibers are naturally fire-resistant, potentially reducing the need for adding toxic flame retardants to clothing. Also, alga biodegrades faster than cotton—the most common natural clothing fiber—and growing it does not require pesticides or large areas of land. Silk textile exposed to S. Coelicolor bacteria for 34 days. Another fast fashion environmental problem that bioengineering could address is dyes, Schiros says. Commercial textile dying uses approximately 3,500 human-made chemicals, including lead-and petroleum-based substances, according to the Swedish Chemicals Agency. Of these, the agency was able to detect 2,400 in finished clothing products. Five percent of the chemicals found are potentially hazardous to the environment and 10 percent of the 2,400 chemicals found in finished clothes may harm human health, the agency says. Making these coloring agents adhere to fabric also often involves using poisonous solvents, fixing agents, salts and large quantities of water. Lab animals exposed to some of these dyes exhibit adverse health effects, including allergic reactions as well as reproductive and growth problems. The EPA has declared one commonly used clothing dye ingredient, benzidine, and its derivatives to be “reasonably anticipated to be human carcinogens.” Dyes that contain it, along with other so-called “azo” dyes, are banned from import by the European Union. Such chemicals may leach from clothing into skin and are also found in textile dye factories’ wastewater which is often dumped directly into the environment without treatment. But significant challenges remain in using such techniques to replace both textiles woven with nonbiodgradable human-made fibers and dyes made from problematic chemicals. Producing bioengineered materials durable enough to stand up to normal wear and tear is a major hurdle, Schiros says. She has tried to overcome this by treating some of her textiles with indigenous preserving techniques—such as tanning with smoke instead of chemicals—which she says lend her bio-leather strength and water resistance. These ecologically benign textiles are so far limited mostly to the realms of the laboratory, science competitions and high-fashion runways.